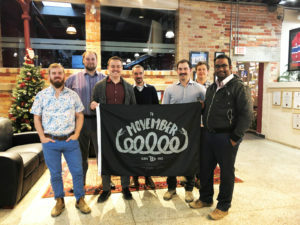 The staff of NA Engineering Associates Inc. set a goal to raise $1,000.00 for “Movember” supporting research and awareness surrounding men’s health issues, specifically prostate cancer, testicular cancer, mental health and suicide prevention. The team committed to a month of mustache growing and successfully surpassed that goal raising a grand total of $1,750.00! It was a highly successful fundraiser by all involved. Over the month, team members came up with new creative ways to raise funds through bake sales, contests and other initiatives which helped surpass our goal! Special thanks to all who participated, donated to our team’s efforts and raised awareness.